Josh Brookes became the third different race winner, from the third different manufacturer, at the triple-header round of the MCE Insurance British Superbike Championship at Oulton Park as the Tyco Suzuki rider scored his first win at the Cheshire circuit after an epic battle between the leading five riders. On the opening lap Byrne hit the front of the pack from race one winner James Ellison on the Milwaukee Yamaha with Brookes and Alex Lowes tucked in behind. Ellison made an early push to pass Byrne, but the defending champion had pulled the lead back by the start of the second lap. The Nissan GT-R Safety Car was then deployed when Michael Rutter suffered a technical problem and as the track was cleared the pack formed up ready for the race to resume on lap six. Byrne held the position despite the attack from behind as Ellison was mugged for second place by Lowes at Island Bend and then pushed to fourth when Brookes pushed through at Shell Oils corner. Tommy Bridewell was having an impressive run on the Halsall Racing Kawasaki and had was running in the leading pack. He was bidding to make a move on Ellison and with a move at Hizzys chicane pushed the Milwaukee Yamaha rider to fifth. At the front Brookes moved ahead of Lowes on lap twelve at Hizzys chicane and then was dicing with Byrne for the lead. A lap later and Brookes had edged ahead but Byrne was soon back in front as the pair scrapped for the lead but it wasn't until lap thirteen when the Tyco Suzuki rider made a move that would stick as he dived down the inside at Shell Oils corner and then defended hard to keep Byrne at bay. Byrne was trying to make another move on Brookes but Lowes was attacking and the pair made contact on the exit of Shell Oils corner as they fought for the second place and the two podium credits. Race two winner Byrne was able to push ahead to leave Lowes third at the chequered flag with Ellison fourth and Bridewell in fifth. The scrap for sixth was as intense as it was for the lead with James Westmoreland firing the Buildbase BMW ahead of Keith Farmer and Howie Mainwaring who with the Tsingtao WK Bikes team scored his best result with an eighth place finish. Jon Kirkham claimed ninth to maintain his position inside the top six. The second Samsung Honda of Ryuichi Kiyonari completed the top ten despite running on at Hizzys chicane on the seventh lap, rejoining almost at the back of the pack and having to carve his way back up the order. 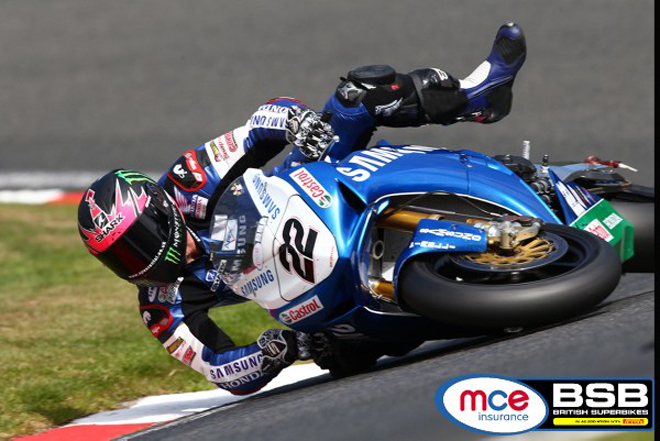 Alex Lowes had a unusual end to the Datatag Extreme Qualifying session at Oulton Park this afternoon as the Samsung Honda rider set an impressive lap time to claim his fourth pole position before crashing out unhurt at Shell Oils corner on his return back to the pitlane. Lowes had set the precedent in the early stages of qualifying, topping both Q1 and Q2 from Shane 'Shakey' Byrne and PJ Jacobsen respectively and in Q3 he was aiming for the hat trick. The Samsung Honda rider characteristically waited until the final moments to set his best lap to push Byrne and Rapid Solicitors Kawasaki from the top of the standings. However Lowes lost the front end of the Samsung Honda at Shell Oils corner on his return, crashing unhurt. Jacobsen had his best qualifying performance of the season in third; the Tyco Suzuki rider had been a front row starter at Thruxton earlier in the year but the New Yorker out qualified his team-mate for the first time with Josh Brookes heading row two in fifth. Milwaukee Yamaha's James Ellison completes the front row in fourth. Halsall Racing Kawasaki celebrated their best qualifying performance since their debut in the championship with Tommy Bridewell ending the session sixth fastest on his debut event with the team as he edged out Jon Kirkham on the first of the Buildbase BMWs. Lloyds British GBmoto Honda's Dan Linfoot also had his best qualifying result of the season so far in eighth as he completed row two ahead of Keith Farmer on the second of the Rapid Solicitors Kawasakis and Buildbase BMW's James Westmoreland.